Duty Free America Terminal 7, JFK International Airport, New York. Monthly heavy cleaning of duty free luxury item stores including Armani and Coach, totaling some 50,0000 sf. H&M Stores; 21 Retail Outlets in Connecticut, Massachusetts, New York & Rhode Island. Daily cleaning for stores ranging from some 50,000 - 200,000 sf, consisting of retail, administration, stock areas, employee lounges & rest room facilities. Home Depot; 20 Big Box Retail Outlets in Connecticut, Massachusetts, New Hampshire & New York. Periodic heavy dusting and fixture cleaning for outlets ranging from 400,000 - 1,100,000 sf. Hudson Group; Hudson News Outlets. JFK International Airport; New York. Daily cleaning of stainless steel, glass and metal surfaces, and wood polishing; complemented by weekly high dusting and cleaning programs for multiple news and convenience merchandise stores located in Delta Terminal 2 and American Airlines Terminal 8 in JFK International Airport. ZoomSystems; Terminal 4, JFK International Airport; New York. 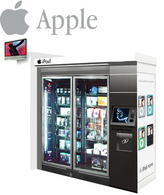 JCM provides inventory supply management and cleaning for ZoonSystems' automated retail outlets featuring an array of Apple's iPod and iPhone products.